I hate gyms. I do. Sometimes I do force myself to exercise, since it’s supposed to be good and healthy and all that. But I just think it’s a big waste of my time. I just can’t imagine myself being excited about going to the gym or even just wanting to go. I do like the bike, though. I do. I can sit there for hours reading a book. Yeah, that’s the only thing that makes me feel a bit less guilty for going to a gym. If I’m going to stay there for an hour, at least I’m going to exercise my brain. And that is something I really like. 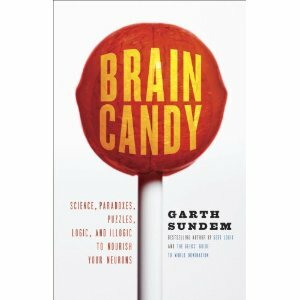 Not too long ago I was searching for new books at my local library and ended up getting Brain Candy, by Garth Sundem. I had no idea if the book was good or not, but how bad can it be? It so happens that I didn’t have time till today to actually read the book. I’ve just started but it’s full of intriguing information. Do you know the books promising to keep your brain young through a training regimen of puzzles and thought exercises? (I do see the irony here, just bear with me) Well, not so easy as they make it be. Our brain creates new connections when exposed to a new challenge, but once you’ve done your nth Sudoku, your brain’s as wired as it’ll ever be. Doing more Sudoku only reinforces these existing pathways but won’t create new ones. The same with other types of brain games: crosswords, memory games, or timed math problems. If you understand how you’ll complete a puzzle, it’s too easy. Only challenging new experiences can force your brain to create new connections between cells. I kind of like this. It’s weird, but it makes me want to go learn something new. Maybe a new language? Maybe finally getting the courage to take that Calculus class I so wanted? Who knows what the next year will bring. All I say is: bring it on! I can’t wait to learn something new. How about you? Any exciting new challenges in your life?